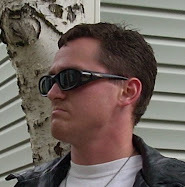 The Sci Fi Catholic: Hey, Kiddies, Santa Claus is Dead! 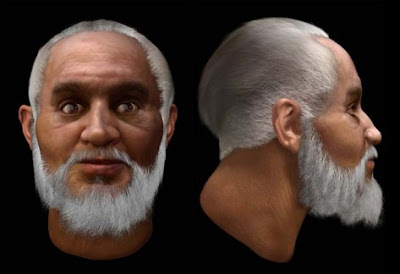 Okay, so I recently discovered that a forensic scientist has measured the skull of St. Nicholas and reconstructed his face. You hear that, kiddies? Santa Clause is dead! Dead!! And we've got his skull!!! That site in turn sends us to a newspaper article in the Guardian for more information about the reconstruction process. I assume the whiteness of the beard is more-or-less an artistic flourish, though if it weren't there, we would all likely riot. But never mind that; as the above linked sources tell us, the most interesting feature of the face is the healed, broken nose, which our sources conjecture was received in a fist-fight with Arius at the Council of Nicaea. As I've said before, you do not mess with Santa. In reality, of course, what our sources don't know, but what we know, is that these actually are the remains of Arius. Santa faked his death before taking his harrowing journey northward. After many arduous adventures during which the saint demonstrated his fortitude and bravery, he at last arrived in the land of the frozen north where he encountered (and subsequently converted) a race of elves that had emerged from the Hollow Earth via the Symmes Hole at the North Pole. These elves had already bred a magical race of flying reindeer, and they assisted Santa in building his massive military-industrial complex at the Black Precipice (that is, the great lodestone mountain near the Pole, which causes compass arrows to point north) in order to bring his generosity to the children of the world through the delivery of toys to stockings. He then sent his cloned agents, known as Mall Santas, out into the world to gather intelligence on which children were naughty, which ones nice. This business was moving along nicely for over a millennium and a half until an ambassador from Mars offered Santa, who had grown jaded by the consumerism with which his operation had become surrounded, the opportunity to start afresh on a new world. Though tempted, he rejected the offer--except the Martians wouldn't take no for an answer. The Martians attacked Santa's workshop complex, and the mechanized elfin units were unable to fight them off. The workshop was destroyed, and Santa and his reindeer were taken hostage. On Mars, Santa discovered two races of Martians--the evil Nutkrakerians and their slaves, the Ratulians. The Nutkrakerians dominated the Ratulians with their superior technology, particularly their battle mecha known as TORGs. The Ratulians, however, were familiar with an ancient form of high-flying wire-fu that took advantage of Mars's low gravity. After converting them to Christianity, Santa led the Ratulians in a slave revolt, assisted, of course, by his reindeer--particularly Rudolph, whose nose can not only glow, but fire energy blasts. In the end, Santa fought a one-on-one mecha battle with Lord Volmar, the Nutkrakerian emperor, before returning to Earth, and the North Pole, in triumph. As I said, you do not mess with Santa.